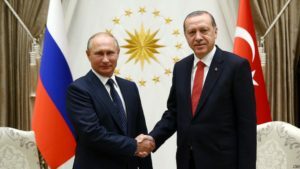 Turkey is all set to host a meeting between three leaders of Russia, Turkey and Iran on Wednesday. The trilateral meeting will be held amid the ongoing civil war and recent significant developments happening on the ground in the seven-year civil war. Vladimir Putin, the Russian Putin had already arrived in Anakara on Tuesday who was followed by Iranian President Hassan Rouhani in the same evening. The leaders are holding this meet for the second time since the last which was held in the month of Novemer to discuss the Syrian situation. Both Iran and Russia support the Syrian government in the multi-faceted crisis and Turkey supports the moderate opposition. But despite that they have been in close cooperation through a series of talks which aimed at finding a solution to the deadly Syrian conflict since the last year. The so-called various “de-escalation zones” were part of an agreement reached between the three powerful leaders in Syria as a result of multiple rounds of talks throughout 2017. The last meet was held in the Russian city of Sochi and Astana of the Kazakh. Apart from the trilateral meets, bilateral relations between Turkey and Russia have been increasingly well. Both the sides agreed on a deal in December 2017 for Ankara to buy S-400 air missile defense systems, despite the fact that NATO was concerned about the deal. Russia has been playing a major role in building Turkey’s first nuclear power plant. The three countries seem to have reached a consensus over the Syrian issue as a result of their will to solve the crisis, according to Mensur Akgun, who leads the international relations department at Istanbul’s Kultur University. 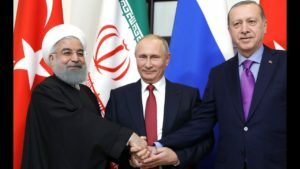 “As the influential actors on Syria, none of the three has interest in the continuation of the crisis and the US presence and influence on the war-torn country,” Akgun told News Agencies. A Lebanese political analyst Tewfik Shuman has said that the new efforts to resolve the Syrian crisis will have to take into account the new realities on the field as well. “That is the opposition’s recent losses and Turkey’s role in northern Syria. This followed a deal that involved exchanging Eastern Ghouta for Turkey entering Afrin,” he told News Agencies. According to the news reports, Syrian government forces seems to be close to taking full control for the opposition stronghold of Eastern Ghouta with the state media reports that the fighters have been evacuating from the area near the capital Damascus. The control over the Damascus suburb will be a major development for President Bashar al-Assad’s efforts to reclaim his lost territories in the seven-year civil war. Turkish President Recep Tayyip Erdogan has condemned the humanitarian crisis that occured in Eastern Ghouta in as a result of the siege imposed by Iran and Russia-backed Assad government on Eastern Ghouta various times. As per the reports, Turkish forces and Free Syrian Army (FSA) have taken full control of northwestern Syrian region of Afrin in late March this year, from the US-backed Kurdish People’s Protection Unit (YPG) fighters as a result of an operation launched in February.